If you’ve got a keen eye for film, chances are you’ve noticed how powerful a lateral tracking shot can be. Whether you’re trying to make your product review footage as slick as possible, or trying to make a shot in your indie film more dynamic, the camera slider is an absolute necessity. Today we’re going to find you the best camera slider to help you figure out which one is the best to suit your needs as a filmmaker. We’ll help you not only understand which ones are the best, but why as well, because we know that unfamiliar camera gear can get really confusing. 1.1 What Do These Technical Terms Mean? 1.9 What Is A Camera Slider? 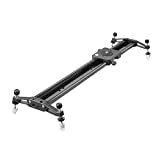 Shark Slider S1 Special Bundle 53"
Motorized camera sliders enable you to pre-program your camera movements to have your slider execute them perfectly. This has many benefits, including the following. Increased precision – Programming your movements ahead of time means you can have your camera pan precisely pan or slide at the exact moment you want it to. Consistency – In addition to the movement being precise, it will also be consistent, meaning you can repeat the same camera movement over multiple takes. Time lapses – The incredibly slow, steady speed of a motor is perfect for time lapses that incorporate movement, adding another layer of depth and quality. Of course there are a few minor drawbacks. Motorized sliders will be more expensive, and also include more parts that can break or require maintenance compared to manually operated ones. Manual ones will typically also have larger payload capacities, as insufficient motor strength would be the point of failure in terms of heavy camera rigs. Like most varieties of filmmaking equipment, all of the sliders we reviewed were either constructed from carbon fiber, or an aluminum alloy. Carbon Fiber tends to be much lighter and also more ridged than aluminum. It can be a bit lighter, but is also more prone to breaking if dropped or thrown around. However, what we noticed when reviewing these sliders was that carbon fiber ones seemed to have less issues with smoothness than the aluminum ones. What we’ve noticed is that equipment that is handled a lot is preferred to be aluminum (like glidecams), and more delicate equipment is preferred to be carbon fiber (like camera sliders). DSLR sliders are one of the best purchases you can make as a content creator. Here are a few of our favorite reasons why. They make you look like a pro – The easiest way to look professional is to have smooth, flawless motion shots. Incorporating them into your films can help convey additional meaning, and set you apart from other amateurs who are reliant on just their hands. They’re relatively cheap – While some of our recommendations are cheaper than others, even the most expensive one won’t cost you more than a couple hundred dollars. Accomplishing a similar effect with proper cranes or dollies would otherwise cost you thousands. They open you up to a much wider variety of possible shots – In addition to the obvious sliding shots you’ll be able to get, you’ll also be able to pan in, pan out, and even do slick time-lapse shots! Padded carrying case with pockets for accessories &shoulder straps. It can be mounted on a tripod with multiple 3/8-16 and ¼-20 threaded holes. 31″ long with 25″ of travel – able to be extended to 47″ with addition of two extension rails. Multi-position adjustable legs allow leveling on uneven surfaces. The motorized sliders we reviewed were great, but if you simply want the best, smoothest, most reliable DSLR slider on the market, the obvious choice is the Shark Slider S1. This slider takes the cake in terms of design and precision, and is definitely worth the premium if you have the money in your budget. Even if it’s a little bit out of your price range, we suggest purchasing this one, as you’ll save money on cheaper sliders that you’ll end up wanting to upgrade anyways. First off, the build quality is incredible and sets the standard for sliders. We even encountered one reviewer who referred to the manufacturing as “Apple Quality”. The flywheel system really sets this slider apart, allowing you to slide the camera practically hands-free after the initial push. Because this slider relies on a belt for the movement rather than a ball-bearing system like every other slider we examined, the motion is smooth and effortless. The counterweight system is one point that we noticed coming up again and again throughout the copious 5-star reviews for the product. By adding or removing counterweights from the shark, you can precisely determine exactly how much tension you want with your slides, to a degree simply not achievable with other sliders. The final feature that really sets the Shark apart from the crowd is inclusion of the extension rails. While all the other sliders on this list are fixed to one set length, the Shark can be adjusted to be as short as 31″, and as long as 53″. 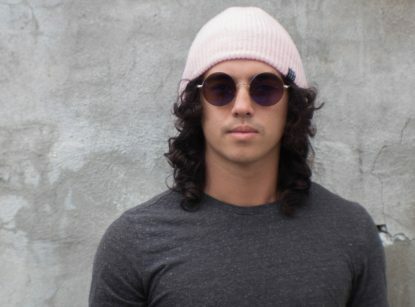 This adds a layer of versatility, allowing you to only use as much length as you need at any given time. One thing to note is that the payload capacity is decreased when the extension rails are in use, however, adding additional support to the rails can negate this. It even comes with a handy little carrying case! Controllable rotation, allowing you to do tracking or panorama shots. Adjustable starting and ending points, sliding speed, dwell time, pause time, and number of pictures. The GVM Camera Slider is by far the best well-rounded motorized camera slider on the market. It may not be as much of a premium choice as the shark slider, but it is still a very premium product we thought was very impressive.. Sliders are a really effective tool, but there’s only so much you can do with your bare hands. If you want a perfectly timed precise shot, you will need to incorporate an automated motor. If you’re planning on doing any sort of moving time-lapse shooting, this is the only choice for you. Moving time lapses require a camera to move at a very slow, precise speed to make sure everything comes out perfect. This particular slider allows you to adjust the sliding speed, dwell time, sliding distance, pause time, and basically everything you need to have complete control over your camera motion. The motor is also completely silent in case you are worried about camera noise when shooting interviews. The slider has settings with a rotating head, allowing you to do panoramas and parallax shots. The feature that stood out to us the most however was the ability to do tracking shots. The slider comes with a device that can be planted on a subject so that your camera will follow it as it slides through your preset settings. It’s really cool! Not only does this device have excellent motor functions, it’s also a very well built, high quality slider. It weighs only 5 pounds, has an 11 pound weight capacity, is nearly 32″ long, and is constructed from 8 layers of carbon fiber making it very stable despite its light weight. Pretty much every single piece of this slider is adjustable, so you can be sure it will work great in whatever situation you throw at it. It even comes with a great carrying bag and a shutter extension line! 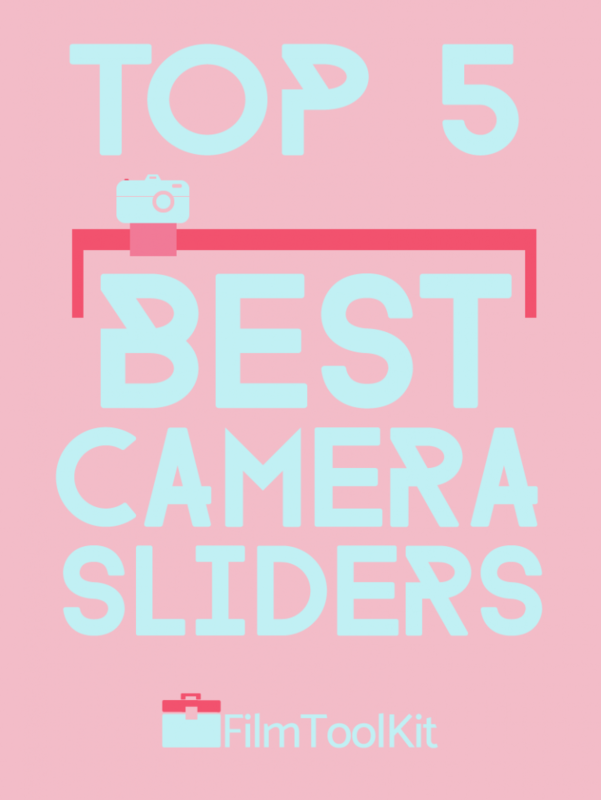 Note: This camera slider is significantly more expensive than any other on this list. This is the best of the best for those with a lot of money to burn. All the sliders on this list are great for panning your camera from point A to point B. However, what if your film requires some more complex camera movements? 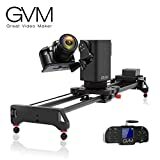 This 3-axis gimbal from GVM will allow you to program vertical as well as horizontal movements. As you’ve seen with our #2 choice, GVM makes very reliable products that are more than worth their higher price point. The production value added by 3-axis motion is incredible, and opens up a massive variety of shots that you could never get with a traditional slider. Rather than try to painstakingly explain what this will end up looking like, here’s an excellent video from GVM that showcases the types of shots you can get. The maximum payload capacity is very impressive at a whopping 22 lbs, meaning just about any camera rig will fit on the bad boy. You’ll also see a return of the gear-belt transmission the shark utilized that we were raving about – giving this slider an ultra-smooth quality that simply can’t be attained with ball bearings. All in all, this is a very expensive piece of gear we only recommend for those working full time in production. 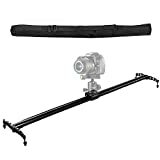 However, if you want the most versatility with a slider you can get, this is a great choice. Includes Carrying Bag, Microfiber Cloth, 2x L -Shape Hexagon Wrenches, 1/4″ to 3/8″ adapter. We think this is the best slider you can get on this list in terms of the cost to quality ratio. 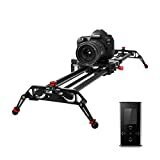 The Imorden ball bearing camera slider is one of the most popular camera sliders on amazon, and has very strong reviews. The plate on the slider features a bubble level to help you make sure your shots wont end up unintentionally canted. There are holes on both ends as well as the middle of the track to give you multiple mounting options with either one or two tripods. The small legs on each side are actually coated with rubber to prevent sliding and scratching; a touch we really liked that most other sliders neglected. The slider is available in 3 lengths, 32″, 40″, and 48″, with all having an excellent maximum payload of 15 lbs. This load capacity is definitely on the higher side and will support any consumer grade camera rig. It comes with a very handy nylon carrying case with an adjustable strap, and even a microfiber cloth for maintaining your equipment! If you’re on a budget and want to make sure you’re getting the best camera slider for the money, go with the Imorden camera slider. I’ve quoted many reviewers saying that it is the “perfect entry level slider” and that it’s an excellent value for the money. The company has also been constantly praised for their excellent support and customer service, so this slider is a really safe bet! Includes adjustable legs to raise slider 2″ off ground. Bubble level included. If you’re completely broke but still want to be able to achieve smooth lateral motion, this is the best choice. 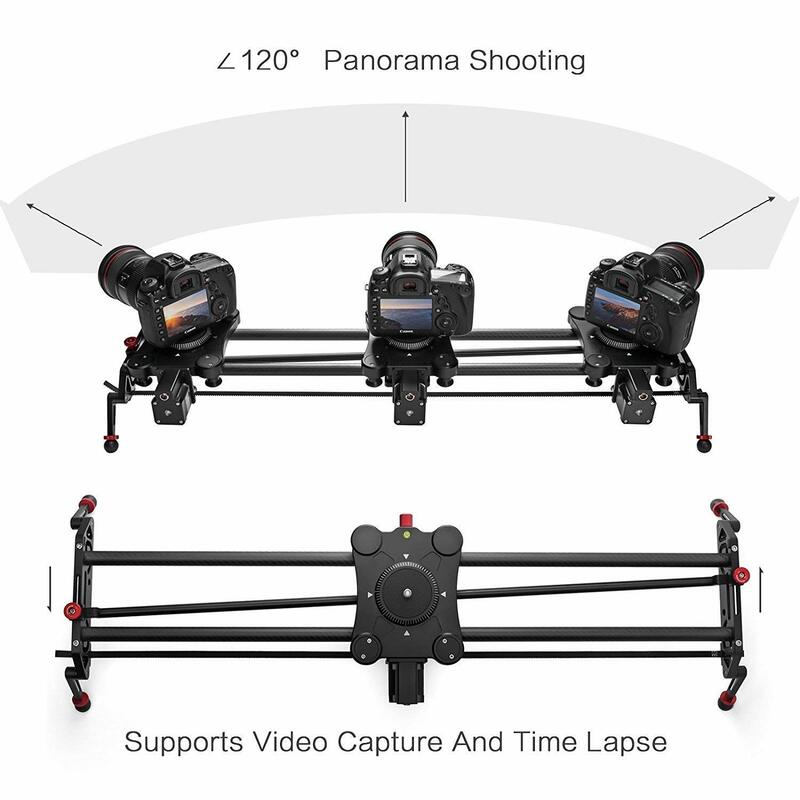 This product brings a functioning slider in a much more affordable, albeit heavier, form. The quality is nowhere near that of their carbon fiber offering, but it still seems to function quite well. It’s able to be mounted onto a Tripod through holes on both ends and also in the middle, allowing you to use 2 tripods or 1 to stand it upright. It also includes two pairs of legs to raise the slider up to 2 inches off of the ground. It comes in several sizes ranging from 24″ to 48″, with the cheapest model available for under 40$! That’s the most accessible slider we’ve ever seen. The payload support is on the lighter side, only rated for around 11 pounds of camera gear. However, if you’re working with that heavy of a camera rig, chances are you already have the budget for the more hefty carbon fiber option. As we’ve already praised Neewer in this article, this slider is of very high quality despite its cheap price. There are a few complaints we did notice in our research that pertained only to this cheaper model. A few users remarked that the metal and other materials feel a great deal cheaper than the ones on the more premium models. This effects the weight, and in some more defective cases, can make the ability to get smooth slides a bit inconsistent. Bear in mind these complaints are still relatively rare and the vast majority of consumers are still very satisfied. Here are some of the key points you should examine when determining which slider you should get! This is the most important factor you will need to take into consideration. Longer sliders are pretty much objectively always better. Unless you’re shooting in some ultra-specific situation where you can only fit a small slider, longer ones will always give you more options. However, longer camera sliders are also more expensive, so if you’re on a tight budget and just need a small amount of movement, the shorter sliders will do you just fine. Depending on the material used in the construction, each slider will have a different payload capacity. If this capacity is exceeded, the slider may fail to slide smoothly and it will defeat the purpose. The capacity also tends to be lower for motorized units, so carefully consider how heavy your camera rig is going to be before making a purchase. A DSLR by itself is just a couple pounds, but larger camera rigs with tons of accessories can get quite heavy quickly. A camera slider is a device comprised of tracks that are placed upon a set of tripod legs, a light stand, or even the ground. These tracks are equipped with a small carriage that can mount a camera or other device to achieve smooth motion. The device allows you to slide your camera in a vertical, lateral, or even diagonal motion that will completely eliminate choppiness if used properly. We think that the slider is one of the most necessary and versatile tools in any production kit. In film school, I often used a skateboard as a substitute when I did not have access to one, but that will only take you so far. Here’s a video we found from Cinecom.net’s YouTube channel that illustrates 10 really cool things you can do with a slider. Buying one of these will massively expand the variety of shots you’ll be able to get. If even our cheapest option is still too much for your budget, we’ve found this YouTube video from Film Riot that will show you how to make a camera slider at home! It only comes out to about $10!